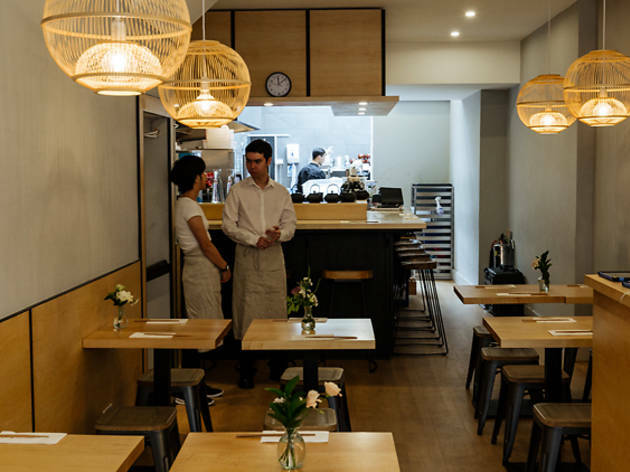 A Japanese home-cooking joint, from the people behind Kanada-Ya. ‘Machiya’ is the Japanese word for a traditional wooden townhouse – which sums things up rather nicely. 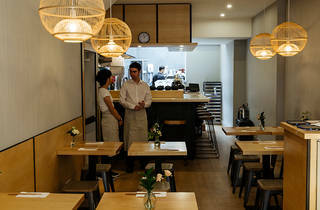 A restaurant from the people behind award-winning tonkotsu specialist Kanada-Ya, the remit here is Japanese home-cooking; the kind you imagine might be served in a traditional wooden Japanese townhouse. It just happens to be dished up in a clean, bright little restaurant on Panton Street, to the rather incongruous sounds of Norah Jones. Great news for anyone who can’t afford the trip out (far) East. The menu is short, and the dishes haven’t been compromised to appeal to Western palates. First up was a transparent tofu custard, that looked like jelly but tasted sweet and creamy. Dotted with spring onions and crowned with a bird’s nest of ginger, it was sharp and bold, and unlike anything I’ve eaten before. 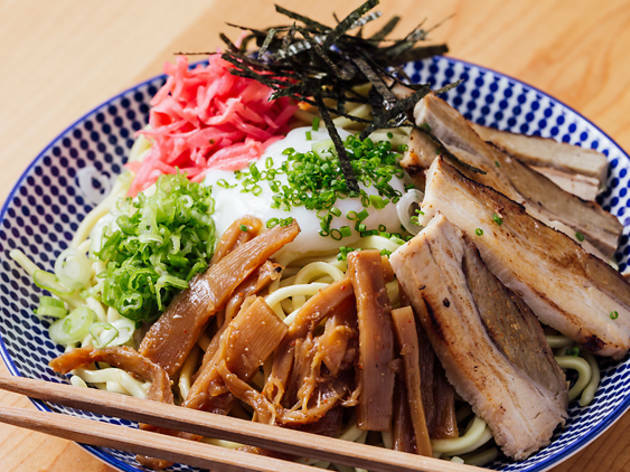 Next came ‘abura soba’: slippery, well-flavoured egg noodles topped with shredded nori, pork belly and a daringly undercooked egg. Packing a serious chilli and garlic punch, this dish was not for the faint-hearted. A side of baked sweet potato drizzled with lime butter was a less successful taste adventure (so wet and so sharp!). There were simpler and more expected pleasures, too. Miso soup came comforting and hot, infused with toasted sesame. My personal highlight? 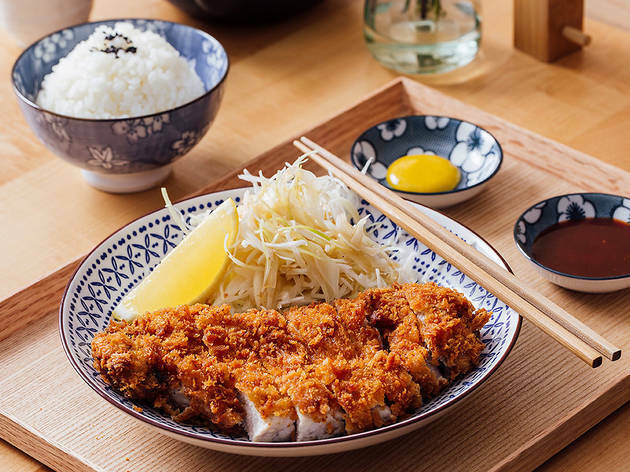 Wonderfully crispy panko-breaded pork served with plummy, sweet tonkatsu sauce. But it’s the noodles and the tofu custard that have stuck in my mind. Go to Machiya and you’ll have a meal you won’t forget. You’ll also only spend about £15 a head on food (only two dishes on this menu are more than £9). That’s pretty special in itself. 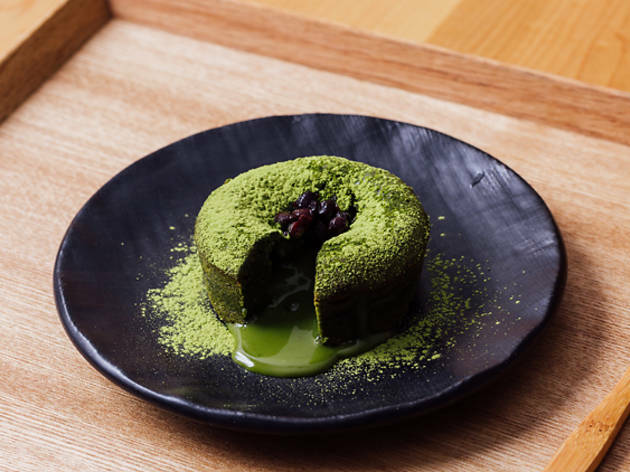 Machiya serves traditional Japanese dishes alongside unique patisserie inspired by great food halls of Japan. Our kitchen serves dishes such as tonkatsu, Japanese curry, Wagyu Katsu, teriyaki and much more. And downstairs, our cosy, intimate drinking den specialises in quirky and fun cocktails, with highlights including the Jigglypuff and the Smokey Negroni. Throw in some unusual Japanese whiskies and sakes, and your post-work drinks are pretty much sorted. Our bar also serves up a selection of Japan’s favourite bar snacks including a wagyu slider, a pop-katsu skewer and a bowl of fiery Machiya hot wings. Our snacks change regularly so make sure to check in on our social media channels for updated information. This restaurant has been on my "Want to go" list for a while now and we finally managed to get a couple of friends together and went on a Tuesday night. The food is an absolute taste sensation. When they call their chicken wings "hot", they really mean it. The portion sizes may look small when they first arrive, but once you start working your way through the food, it'll not only curb your hunger, it will also satisfy your soul. If you are planning on going, make sure you go with friends who you can share with, because you wouldn't want to miss out on anything that's on the table. We came across Machiya by chance when hungry late on a Tuesday. It was packed but someone leaving told us the food was great so we thought we’d take a punt. They were right! We had veggie curry, veggie noodles and chicken noodles. Everything was lovely - not fussy at all, just good tasty food at sensible prices. The sencha tea was also delicious and I’m not normally a fan. And though we didn’t try it, downstairs was an unexpectedly cool little sake bar. We’ll be back for that. You know it's good when I'm back twice in a week to eat here! I like that it's off the main road, so it's not too noisy but also close to the new Japan Centre - practical if you want to grab a few items after such a delicious meal. I heard about this place some time ago but didn't have the chance to try it until last week. The restaurant itself is quite small, so if you don't get there early enough, there's a queue to wait for a table. But luckily, both times I came, I beat the crowds! There's two forms of seating; bar stools along the kitchen counter and regular table and chairs. The former is probably a good shout if you're eating solo, while the latter is good for a couple or groups of people. Both times, I sat on the tables and chairs. I did notice that Machiya does a good amount of takeaway orders via delivery services, which I'm very happy about because it means I can get this delicious food delivered to me! The first time I came here, I had the Gyudon. This is a typical Japanese rice dish - the bowl is packed with Japanese rice, which is sticky but oh so fluffy. 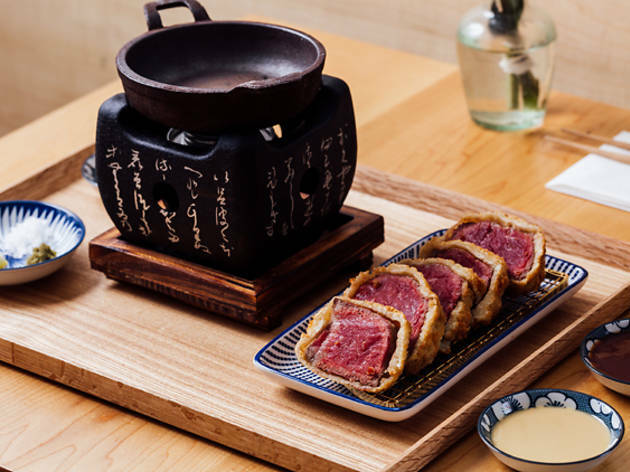 It's then topped with a very generous amount of thinly sliced beef that has been cooked in a sake and soy sauce mix, which gives the beef a lovely sweet and savoury flavour - a classic Japanese combination. It also comes with an onsen egg in the middle, which is pretty much like an egg cooked sous vide. To top it off, the dish is sprinkled with chives and pickled ginger for presentation. It's truly a generous serving and really fills you up! I liked how jiggly the egg and runny the yolk were - my perfect kind of egg! The second time I ate here, I ordered the Pork Tonkotsu w/ Curry. This comes on a plate with a generous serving of Japanese rice on one side and a huge piece of deep-fried breaded pork covered in Japanese curry sauce on the other. The curry sauce comes with onions, carrots, and potatoes. I'm amazed by how generous their portions are, there was so much rice that I couldn't finish it but definitely devoured the pork and curry! It felt a lot like comfort food because the pork was cooked really well - the breading was thin and crisp, it was not greasy, and the cut of pork was lovely. I'm very impressed by the food here and definitely intend on coming back to try out the other items on their menu! I was left full and satisfied both times! ​I love little authentic Japanese places as I am a bit of a Japanese food nutter and this place really did tick all the boxes. The chicken yakitori was good - the addition of shiitake mushrooms and the glazing was delicious; however it could have had more of the coal flavour associated with yakitori. The Salmon was again, really lovely and was perfect with a bowl of steaming hot rice despite it not earning any major points for presentation. 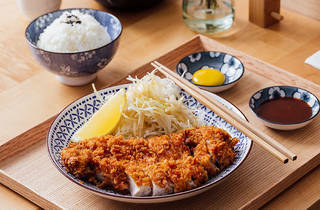 The tonkatsu was by far the best - the crumbing light, super crunchy and delicious with the sides of lemon and condiments. Unfortunately we didn't get to try the Wagyu-Katsu (which is limited to 20 per day - a panko crumbed australian grain fed wagyu, wasabi mayo, homemade brown sauce) this time as we were told (curiously, though it may have been lost in translation) that they were having trouble with the crumbing that day. We also tried the bar downstairs and although small, they have a great selection of whisky, some solid cocktails and friendly service. I know I'll definitely be back for the wagu and whisky! Tip: They don't take bookings so get there early and note that they won't seat you until your whole party is present, so plan ahead accordingly. Don't forget to try the little bar downstairs! They have a great whisky selection. The tasetes are great, authentic casual Japanese cuisines. Wagyu Katsu is great as it's known, but also Gyudon is my favourite. Clean and cosy restaurant. But when it's busy, you might be asked to leave the table after 1 hour stay. I had the mille crepe cake and matcha latte here. Not that impressed with the cake since there are a lot better versions in London, plus just having done a trip to Japan spoiled my taste buds.The matcha latte was good. I still want to go back to try the savory dishes like tonkatsu. I went to machiya few days ago with my boy friend as we read some review. The restaurant is very comfortable and clean compare to kanadaya. A lot of lights and fresh air!!! I had omu rice was ok. Nothing special, standard quality. So as service, no complain. I like to visit for bar down stairs next time. Wonderful food and delightful staff! Machiya is a delight for anyone looking to try Japanese food outside of the normal stereo types. As a layman to Japanese puddings in particular their offer is extraordinary. I would highly recommend the matchia fondant cake. One hidden gem of Machiya is it's down stairs cocktail bar which offers a remendous selection of wonderful cocktails. Look forward to going back again soon. Nice little place, relaxed atmosphere with reasonably priced food. Really recommend the Wagyu beef that you cook yourself, really worth the price tag. 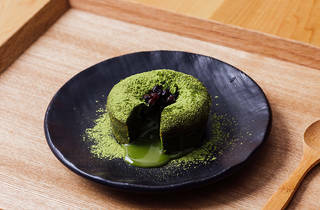 The desserts are really enjoyable, personally I suggest the Genmatcha Crepe Cake it's surprisingly light and fresh. 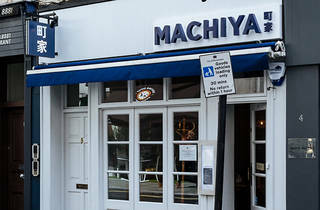 There've been a disturbing influx of mediocre Japanese restaurants in this exact location over the last few years, and one would hope that Machiya would finally end the carnage. After all, they're the sister branch of the ramen geniuses from Kaneda-ya (with an outlet just two doors down!) Unfortunately, I think Kaneda-ya should stick to their strengths and stick to ramen. In Japan, Machiya are the traditional wooden houses that the Japanese live in. The Machiya restaurant doesn't quite have that homely inviting feel just yet, with most of its facade still retained from the previous tenants. The menu's a little limited at the moment, although I did try two of their skewers (the chicken and the minced chicken balls). The chicken with peppercorns is a little basic, and with only two sticks, a little overpriced. The minced chicken balls however, were very tasty, and when dipped in the raw egg they came with, very very complementary. They were unfortunately out of omu rice (omelette rice) on the day I went, which I've heard some good reviews of. But I did try their beef bowl. The beef was pretty nice, as was their onsen egg, but it did seem a little basic overall. 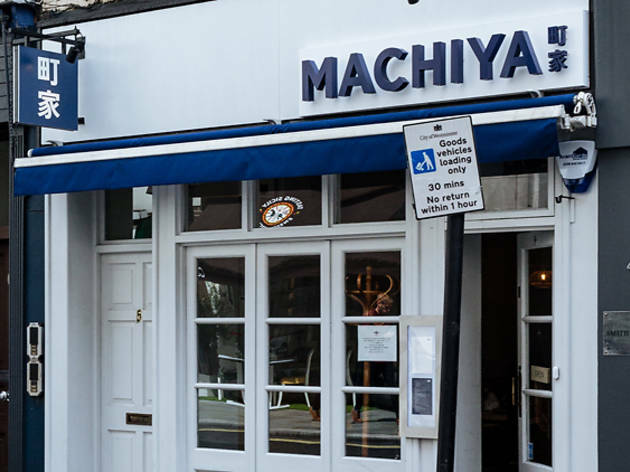 Overall, there's nothing inherently wrong with Machiya, it's that they simply lack a strong personality, and there's nothing that really makes them stand out from the shops that previously occupied the same space. Perhaps after this initial soft launch period, they'll have made some amazing changes to warrant a return, but otherwise, next time I'll be coming in just for their fab matcha latte. 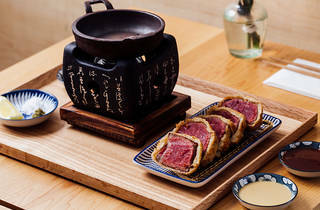 A new Japanese gem in a super central location! 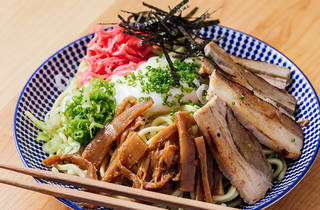 I came here in their first week of opening and really enjoyed the very authentic Japanese food they had to offer. I would really recommend the small plate of minced chicken skewers with raw egg dip, it may sound a little strange but was absolutely delicious! The matcha latte was also really nice and interesting. I had the beef curry which was really nice although not that photogenic! The staff were really friendly and nice. There was one mess up with our order where one dish didn't come out for a long time and we had to ask them for it as it had been forgotten. But despite this I really enjoyed my visit and for its location and quality I think the prices are really reasonable. The place was small but really well decorated and a great environment for our dinner. Loved all the staff shouting Arigatou gozaimasu as you left too!